Breakthrough hit Clash of Clans remains the Finnish studio's defining success, but Supercell's commitment to only running with the ideas that meet its extremely high standards has resulted in a modestly sized catalogue of extremely successful mobile games. But this rigorous approach to launching only the cream of the crop, especially when coupled with a culture that favours relatively small teams and innovation with every new project, means that releases from the studio are few and far between. The result is an ageing catalogue, most recently added to with Clash Royale in March 2016. Two years before that, in March 2014, came Boom Beach, while Clash of Clans and Hay Day both launched in 2012. While this shows that sheer volume of releases is not a metric for success in mobile games, and the number of projects killed off by Supercell before global launch tells its own story, even Supercell is not immune to the growing difficulties of maintaining older games. Even Clash of Clans has felt the effects. 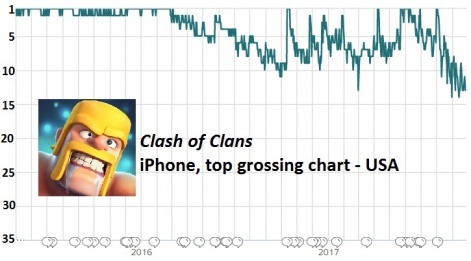 The game went from being a nearly permanent fixture at the summit of the US iPhone grossing charts throughout 2014 and 2015 to 13th in February 2017, Clash of Clans' lowest position since its launch month of August 2012. This is still a position of which any mobile game would be proud, let alone a five-year-old one. But while the game still periodically topped the charts, its loss of consistency in early 2017 was clear to see. Supercell's understanding of live ops came into full effect in May 2017, though, with the Builder Base update that propelled Clash of Clans to a nine-day spell at the top of the US iPhone top grossing charts once again - its longest spell at number one since February 2016. This was a short-term effect, however, that hasn't arrested the general downward slope in the game's grossing positions. It still occasionally spikes up to the top spot, most recently doing so on August 2nd 2017, but throughout September it has mostly been at the lower end of, or just outside, the top 10. As of September 26th, Clash of Clans sat at 13th in the US iPhone grossing charts. Certainly nothing to lose sleep over, then. Also predictably experiencing diminished revenues is fellow 2012 release Hay Day, for whom the regular top 10 US iPhone grossing positions of its 2013 to 2014 glory years appear a distant memory. The game began slipping outside of the top 20 towards the end of 2015, falling further in 2016 and 2017 to largely occupy positions between 50th and 100th. A hit in its own right but never on the scale of Clash of Clans, Hay Day's fall has also been more dramatic. However, yet again, many developers would love to experience a decline of this kind; the five-year-old game remains a solid top-100 grosser, ranking at 70th as of September 26th. Many developers would consider this a success for a new game, let alone one launched in 2012. Meanwhile, Boom Beach - arguably the runt of Supercell's litter, despite great success in its own right - is two years the junior of Clash of Clans and Hay Day. Despite this, its grossing positions have fallen even more rapidly. A top 10 iPhone grosser in the US throughout most of 2015 and early 2016, its descent began in March 2016 - when Clash Royale was launched, interestingly - and by the end of that year it sat between 50th and 60th. Its plummeting chart positons have continued throughout 2017, ranking at 165th as of September 26th 2017. A reduced marketing investment is of course a factor in the grossing positions of any matiruing mobile game, with budgets shifting to prioritise new releases and in-development projects, but the decline of Boom Beach right around the launch of Clash Royale seems significant. Perhaps Supercell decided that significant investment in two mobile strategy games was not in its best interests considering the demands of its new PvP title and, deeming Clash of Clans the game with the strongest brand and future, cut back on Boom Beach. Regardless, Clash Royale has made up for the reduced performance of Boom Beach, and then some. It's not hit the chart-topping consistency of Clash of Clans at its peak - although it's worth noting that the strategy pioneer did so in a less competitive marketplace - but Clash Royale has reaped the rewards for its innovative design with impressive revenues. The game's topped the grossing charts in 141 countries. Specifically in the US iPhone grossing chart, it's been a regular chart-topper that's rarely left the top 10. On September 26th 2017, it was at seventh. And so Supercell's process is vindicated once again, another launch bringing another hit. PvP combat game Brawl Stars, soft-launched in June, is set to be the next in line. Can it repeat the trick? Signs from testing in Canada are positive, with the game peaking at second in the country's iPhone grossing charts on September 5th and ranking largely within the top 20. Supercell being Supercell, it will want to feel completely confident that Brawl Stars can do that - and better - on a worldwide scale before it targets full launch. As one hit matures and fades away, another is ripened behind the scenes and primed to take its place. That is the way of Supercell, and there's no reason to doubt the process will once again pay dividends. You can check out the full PocketGamer.biz Top 50 Developer 2017 list right here. Clash Of Clans started as a game for people who did not have a lot of time to play games, You could clash on the train, in the bath or before a sport, it was a way for non-traditional gamer's to unwind after a hard day at work/the office. It was also a way for the non-gamer to suddenly advance in a game via spending money, it also allowed the same inept gamer to attack a higher skilled by lower level player and win, as unfair as that sounds, , and each clash was short and swift, so they could get to what else they were doing. "While video gamers in the West might frown at the idea of paying to get an upper hand in games, many of their Chinese counterparts find the practice perfectly acceptable. Video game companies will want to take notice of that difference. Noting that the practice of "pay-to-win" in video games is "generally not accepted by Western gamers," but contrast that to how many in China accept games that sell progress rewards or in-game boosts." Any decline is because it now take hours to clash (find a match) at the higher levels, the playing field is dominated by actual real-gamer's and you tubers, who demand fairness and attacking a lower level player is now unacceptable. Its become a traditional western game with an expiry date, with it original exciting perks removed. another player using them and whether the game would grow or decline in revenue because of these. IT GREW beyond belief because others became envious of what othere had. Only when this inequality caused by these microtansactions was corrected, due to social demands did game revenues begin to fall.